Once upon a time home decor used to be a heavy term with connotations of rare and expensive artifacts and masterpieces. Thankfully, today it is used in a much more liberal manner. Home decor can go from subtle and sophisticated to glamorous and fun. We think summers are the perfect time to play around with our homes and make them ooze glamour and fun. Art work is one of the most versatile aspects of home decor and comes in an array of options to please every art lover and interior designer. We have here for you some of our favorite art ideas and how to get them right in your home. While we love bringing the outdoors indoors, we like to do it a little differently. Nature is at its bountiful and beautiful best during summers and spring. Let your windows and balconies open up to the gorgeous scenes and sounds outside. To recreate a touch of the magical fairytale lands and the mystic English moors, however, invest in a few gorgeous landscapes. The landscape painting above takes the ?wow? 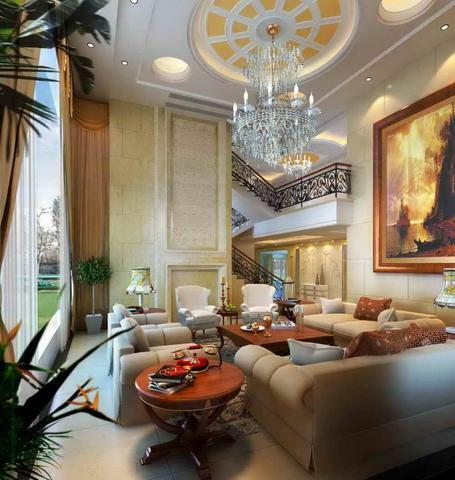 factor of this glamorous living room many notches higher. Steal inspiration and ideas and put up art works in vivid shades and styles on your wall. Whether you are attempting to add vintage drama to your mainly neutral living room or add an element of unexpected art in your contemporary living room, such landscapes in vivid hues of dusk and dawn can add a romantic and mysterious touch to your room. Uncannily glamorous we say! You can easily check out art online and lay your hands on one of these gorgeous paintings without burning a hole in your pocket. Now this is what I call scoring high on fun! Get your toddler to spray and splash on all the colors he can think of on a white canvas. Don?t want to risk your walls? Buy an oversized, colorful piece of art that screams fun and happiness. Put it up in your sophisticated neutral or pristine white living room like the above to add an element of naughtiness and glamor, or let the fun flow unrestricted in your young living room already abundant with colors. If you are scared to go this bold with colors and wall art, pick paintings that have colors, mirroring other elements in the room. Look at the painting above mirroring the greens, reds and blues of the liquor bottles in front of it. A rule of thumb in art work that never fails. I am a big fan of Fernando Botero, and if you, like me, have been acquainted with his works you will know exactly why. Large, exaggerated figures are his domain. When we are talking about increasing the fun and glam quotient of a room through paintings and wall art, we cannot miss Botero. Whether it is satire, humor or mockery that this man tries to depict through his art, we do not know. But what we do know is that his paintings have immense impact and appeal and can lift up even the dullest of walls and interiors. While an original Botero may not be within the reach of everybody, a good first copy works the magic just as well. I bought my Botero Mona Lisa painting from an awesome web store at an awesome price. You can check out their collection too. What a beautiful piece of art! Is that what you are thinking? Mirrors are relatively unexplored but hugely attractive pieces of wall art. For your mirror to make maximum impact in your room and lend a massive dose of glamor, place it right opposite a beautiful painting. When the painting is reflected in the mirror, it will create a breathtakingly beautiful picture. It will create the illusion of ?a painting within a painting? and instantly lift up any space. Whoever said wall art was all about paintings needs to do a double check. While it could be anything from framed postcards of lands travelled, moments captured in black and white, polaroids, DIY items and more, the one that struck me the most were rugs. Yes, the same rugs that adorn our floors. Intricate and beautiful rugs in bright and summery colors, hung on the wall, with or without frames can make stunning wall pieces. Feast your eyes on the one above. How well it complements the antique brick wall! Aren?t you already thinking of digging out those rugs you had discarded and putting them to a new use? Frames on the wall can be the ambassadors of quirky glam in your house. Skim through Pinterest and you will see this interesting trend transform quite a few houses effortlessly. An easy-to-adapt wall art idea, empty frames in right colors, sizes and shapes can be hugely glamorous. The turquoise and vintage silver combination in the picture above is plain genius. Think of your own creative ways to display your frames in your house. And make sure you make it fun and flamboyant! No coy decorating with this one. While this post must have you thinking hard how to introduce glamor in your interiors, I suggest browsing through more home decor blogs to further fire your imagination and really work wonders in your home. Most have enough matter to keep you glued and get you out of an imagination rut if at all you are facing one. Have fun redecorating and do let us know how the above ideas worked out for you. Sophia Mann writes on paintings and art. Her interest in the visual arts developed early when she attempted to duplicate a drawing her brother had brought home as a school assignment. She has been fascinated with this medium of artistic expression ever since. She also paints in her spare time.